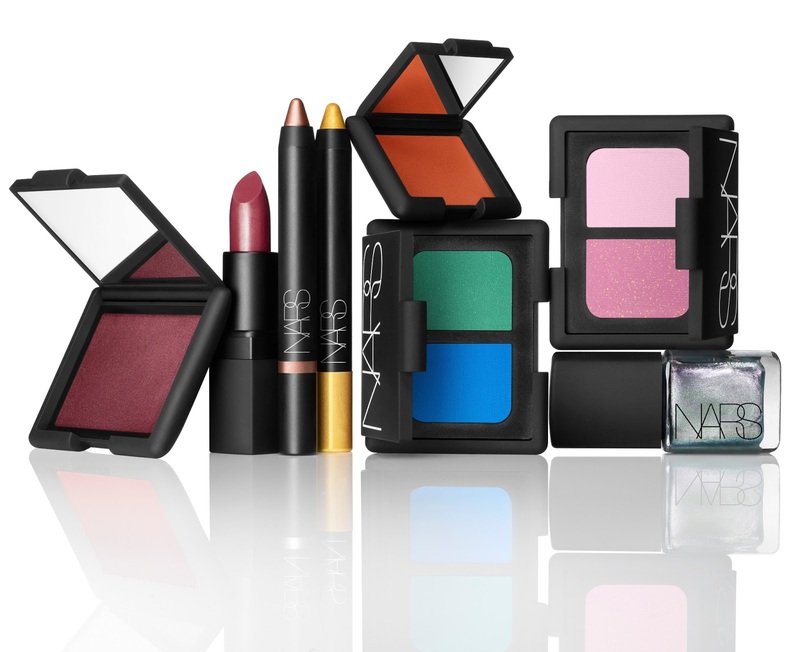 NARS Spring 2013 Color Collection is sure to brighten our mood this month- who can resist all these happy colors? What's even better is that only two of these Spring 2013 items are limited edition: Corcovado Soft Touch Shadow Pencil (the gold one), and the silver green nail polish, Disco Inferno. 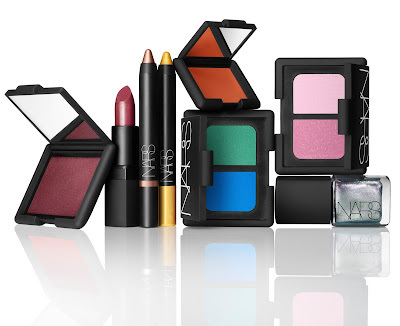 Everything else joins NARS permanent line and will be around to delight us for (hopefully) a long time. I'm especially excited about the wine colored blush (far left), named Seduction, and the blue/green eye shadow duo Mad Mad World. The latter looks very NARS. It'll be interesting to see the texture. I have high hopes. Photo sent by NARS PR. For the most part, we'll be pretty in pink for early spring, but then I think we're going to see a lot of blue and green combinations as Pantone's color of the year, Emerald, takes hold. As for that blusher, isn't it pretty? Oh, I like the look of the blusher. For some reason Sin has been impossible to find on counters here recently - perhaps this is a replacement? That blush looks amazing, but I don't imagine the pink shadows are that wearable. Perhaps someone with very pale blond hair and blue eyes? Interesting color story though. Wonder what kind of staying power the Soft Touch Shadow Pencil has. The last few I purchased smudged quite a bit, even with a primer. Love the blush and I have to try it. I also love that gold pencil. I bought a similar one called Hollywoodland some time ago, along with a fabulous bronzey-coppery one, Scorpios. This new one looks like a bolder colour.